Fresh up to 7x Longer, one of kitchen essentials.Thanksgiving Big Gift: You can select the buy one get one promotion below. 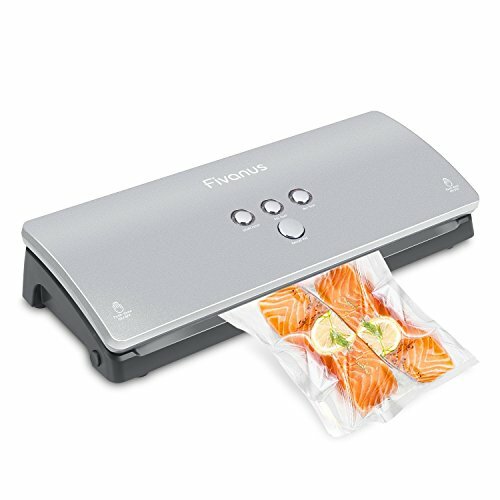 (2 pack free food sealer roll). This machine is small and compact, and does not take up the large space of your kitchen. Unlike other brands is its low decibel work to make your kitchen without the noise impact, let you have a pleasant kitchen life. Multifunctional Sealing Modes, Auto Full Vacuum Seal (6-15s), Half Vacuum Seal (the vacuum level is up to you), Seal Only (10-20s). Equipped with 10 pcs vacuum bags(6 \" x 5 and8\" x 5), so you can get started right away. Easier operation. Press both ends of the top cover correctly to close it (Left to right, heard two clicks). Select the mode you want, easily start your work. Equipped with LED indicator lights clearly show you the status of machine. We take full responsibility for product quality and offer 5-year warranty with 100% satisfaction. Customer service and technical support are available for 24 hours if you have any further requirements. Saving Money in So Many Ways !! Works as well as the more expensive machines! I was so excited to buy this!